Stephan James, Jason Sudeikis and Jeremy Irons star in the Jesse Owens biopic Race. Watch the Race movie trailer below! Based on the incredible true story of Jesse Owens, who shattered Adolf Hitler’s assertion of Aryan supremacy at the 1936 Berlin Olympics. MPAA Rating: PG-13 for thematic elements and language. Based on the incredible true story of Jesse Owens, the legendary athletic superstar whose quest to become the greatest track and field athlete in history thrusts him onto the world stage of the 1936 Olympics, where he faces off against Adolf Hitler’s vision of Aryan supremacy. 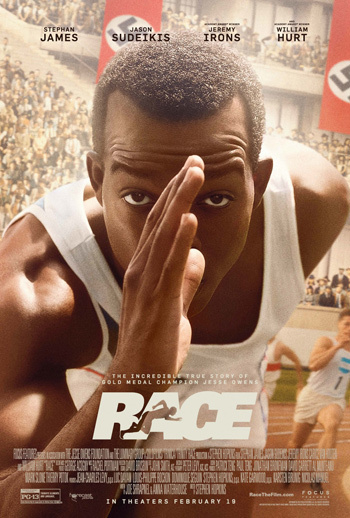 "Race" is an enthralling film about courage, determination, tolerance, and friendship, and an inspiring drama about one man’s fight to become an Olympic legend.